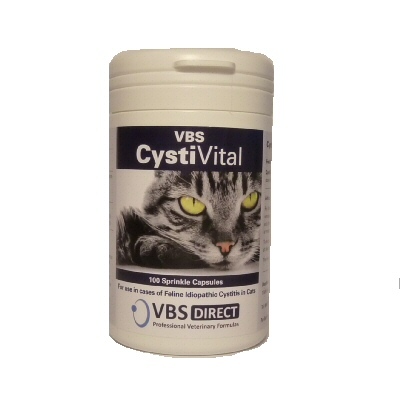 VBS Direct Ltd - VBS CystiVital - Innovative solutions for the veterinary professional. For use in cases of Feline Idiopathic Cystitis. CystiVital is a complementary pet food for cats for use in cases of Feline Idiopathic Cystitis. Capsules can be opened and mixed with food. Mild Cases: 1 capsule per 5kg weight for 14 days and then reduce to 1 capsule every other day, or as recommended by your Vet. Severe Cases: 1 capsule per 5kg body weight twice daily for 7 days reducing to 1 capsule per 5kg once daily for 3 weeks. If symptoms persist continue with 1 capsule every other day, or as recommended by your Vet. The amount many be increased in advance of stress or in any situation that may lead to relapse.